Out of the crock pot and onto the plate. Dinner tonight was as easy as it was delicious. It had everything in it–juicy, tender turkey for good protein, wild rice for high-quality carbs, colorful veggies loaded with vitamins, and a few other odds and ends to amp up the taste. This would be an easy recipe to make your own by adding mushrooms, substituting carrots or sweet potatoes for the squash, stirring in a bit of Dijon for zing and/or maple syrup for a touch of sweetness. For a hint of crunch, you can sprinkle each serving with toasted and chopped pecans or walnuts. Place wild rice in slow cooker and top with squash, onion, and turkey. Sprinkle with seasonings and pour stock over top. Cover and cook on low heat for about six hours. Add the dried cranberries and kale during the final half hour of cooking. I made this for dinner tonight! Very simple and very tastie!! My husband loved it!! Thank you for letting me know, Anna! I am so glad you enjoyed! I made this today. Let me tell you that it was a big hit. My boys (husband and 21 yr old) had two bowls. Very easy to make. Really enjoyed it! Thanks so much for the great feedback, Susan. I am thrilled your family enjoyed and truly appreciate your taking the time to let me know! This was delicious…mine didn’t look nearly as beautiful as it looks in the picture! Glad you liked it, Jennifer…at least it doesn’t have to look pretty to taste great! Do you think you could use fresh cranberries instead??? You could definitely use fresh cranberries for a slightly tarter option. I think I would add them in the last hour or so of cooking if you want to retain some of the texture. If you try, I would love to know what you think! This was a hit, and so easy!!! My husband loved it and so did I. I WILL make this again, the cranberries really made this perfection. Thank you for this wonderful recipe! Thanks so much for your terrific feedback, Lisa. I’m thrilled you both enjoyed! I’m so glad this was a success, Jennifer. Thank you for letting me know! I made this for a church dinner. I used swiss chard from my garden in place of the kale and an herb seasoned tenderloin. It was extremely easy and very well received! 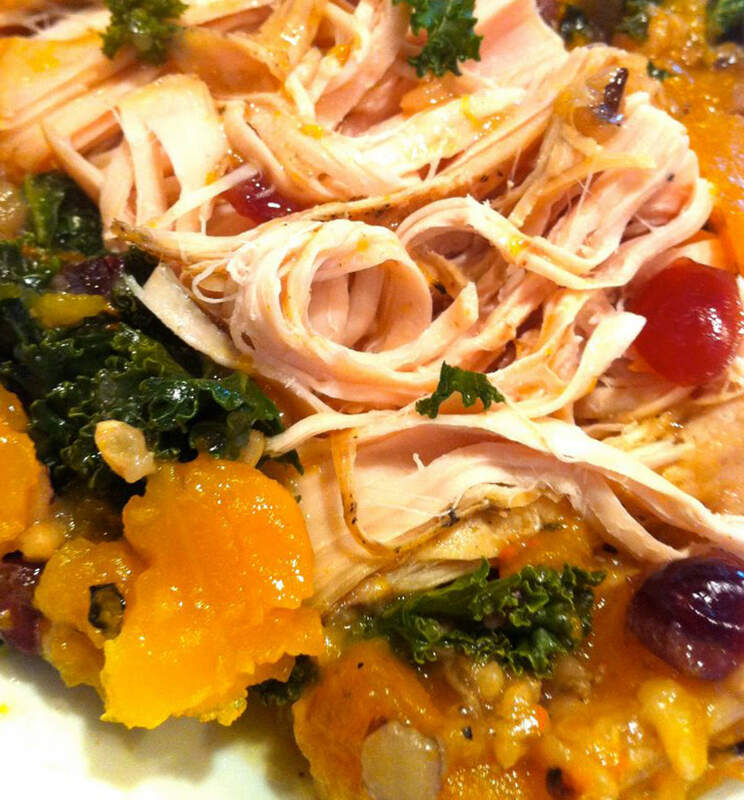 This is a great, easy, tasty fall crock pot dinner! Hi Lisa, I am thrilled this was a hit at your church dinner and truly appreciated the feedback! Wonderful healthy dinner! Definitely one of my fall favorites. My boys enjoyed the dish too! Thanks for letting me know, Kelcey. I’m so glad your family likes it! I have some marinated Turkey Tips..do you think I could use? What about Brown Rice? I think that would be fine although both the tips and the brown rice require slightly less cooking time, so just check a little earlier. If you try, I’d love to know how you make out! Is there any other cut you could substitute for the tenderloin? I’m having difficulty finding it. A whole turkey breast would be wonderful, and pork tenderloin would be a great option with this recipe, too…even chicken thighs for that matter. Hope that helps and that you enjoy! Can you cook it on high to get it done faster? If so how much less time? I tend to cook this on low, but it should take about half the time when cooked on high. Instead of kale, do you think I could make this recipe with egg plant? It wouldn’t hurt to try, Nicole. It might get rather soft, so you could add it midway through the cooking time…although it could cook down and become quite delicious if left in for a longer period of time. How about add half at the beginning and the rest after a few hours as a comparison? If you try, please report back! Thank you for your quick reply! I unfortunately did not see your response prior to making your recipe. Therefore, I added the slices of a medium sized eggplant to the top of the other ingredients, but below the turkey tenderloins, in substitute for the kale. Everything cooked up beautifully and tasted great; however, the eggplant was slightly overcooked. Next time, I will take your advice and will add the eggplant after a few hours! Lesson learned. You’re very welcome. I wish I had been just a few minutes quicker!! do you have nutritional information for this recipe? Sounds yummy! I haven’t calculated it, Kristin, but if you’d like the values, you could use this link: https://www.caloriecount.com/cc/recipe_analysis.php. Hope you enjoy! I want to make this recipe without any rice. How much less chicken stock do you think it would call for? The rice does thicken the dish, but if you prefer to omit it, I would use half the amount of stock. If you try, I’d love to know how you make out! Could I use white rice instead? You could, Melissa, although the cooking time for white rice will be a little shorter. Ideally, you would want to add it 2 hours, give or take, into the cooking time. Otherwise, it will still taste good but be rather soft. Discovered you when I searched for a turkey tenderloin crock pot recipe. Delicious and easy, thank you! I’m on Weight Watchers and calculated the points – only 3 Smart Points per serving (1 slightly heaping cup) and it was SO filling! We will definitely make this one again. Glad you found me, Deb, and so happy this is a keeper. Thank you for the comment and the helpful point information! I made your recipe yesterday and it was fabulous! Everyone loved the flavor and aroma. I loved the simplicity and healthy aspects too! I’m going to share this and make it again and again and again! Thank you for sharing your talents through your wonderful recipes. I’m going to look for more of your dishes to make. Thank you for such a thoughtful comment, Cheryl. I’m thrilled this was a hit and hope you find many more recipes that are equally enjoyed! Spinach should work well, Kimberly. I’d still give it a rough chop–long pieces can seem stringy. You could also stir it in at the end since the heat from the other ingredients will wilt it immediately. If you try, I’d love to hear how you make out! I put the lid on Sunday morning before getting ready for church. Came home from church just in time to stir in the leafy greens and cranberries. This dish was a hit at my house. My husband loved it. It is so filling! He ate it for lunch and dinner. I shared the recipe on Facebook including some of my pics of the meal. I had a couple shares and several friends saying they are going to try it. Such great feedback, Tammy. Thanks for letting me know. I’m delighted this was a success and that you shared it with friends! I was looking for a turkey tenderloin crock pot recipe this morning. It sounded good and I had all the ingredients on hand except for the kale (I picked some up on the way home from work.) Very tasty and I felt good about what we were eating. I would probably use frozen cranberries when I make it again. I will have to check out more of your recipes! I’m so happy this was a success, Becky, and like the idea of using frozen cranberries. Hope you find many more recipes to enjoy! I’m looking at what I’ve got in hand to use in this recipe. How would yellow squash and broccoli work in place of the butternut squash and kale? I think sweet potato would be a wonderful substitution, Nancy. Yellow squash or broccoli would likely become rather mushy unless they were added later in the cooking process. For either of those I’d try an hour, give or take, depending on how tender you like them. Hope this helps and that you enjoy! Any suggestions on how to use the leftovers? I am arming my college age daughter with healthy crockpot recipes with a weekly meal plan but this will be too much for one or two meals for her. You’re such a good mom! Your daughter could wrap the leftovers and a sprinkle of cheese in a tortilla. For a crispy, healthier version of a chimichanga, she could then bake it in the oven. If she likes kale, I’d also recommend a hearty salad with chopped kale and a drizzle of a simple balsamic or apple cider vinaigrette…and perhaps some feta or goat cheese and almonds or nuts of choice for crunch. Tried this and found it very bland. Added lemon and a ton of poultry season to have some flavor. Hubby was not impressed unfortunately. Hi Sheryn, Did you add the seasonings and use the broth? Those things tend to bring out the flavor nicely, but I am sorry it wasn’t a success for you. Hi Ann, I used chicken stock and a bunch of fresh thyme. Also used applewood smoke marinated tenderloins. The tenderloins were amazing, but the rest fell a little flat. Will try again and tweak a few things. Thank you and hope you had a wonderful Thanksgiving! Thanks for the follow up, Sheryn. Maybe just a bit more salt? And we did enjoy our Thanksgiving–hope you did, too!